The D1 trail is located in the Devil's Canyon Area of the McInnis Canyons National Conservation Area near Grand Junction and Fruita, Colorado. 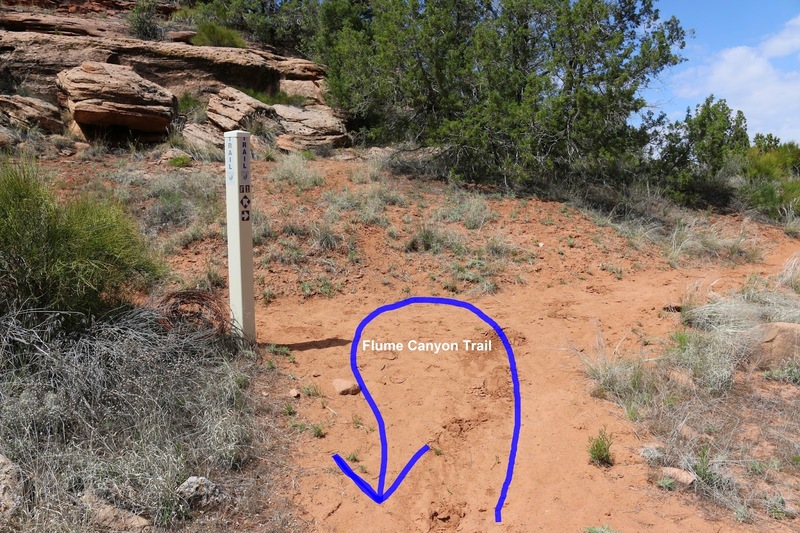 The trail begins at the Devil's Canyon trailhead and stretches for about 3.5 miles to the Flume Canyon F1 trail with many scenic views and settings to satisfy any hikers hunger for exploring nature in a Colorado Plateau high desert setting. 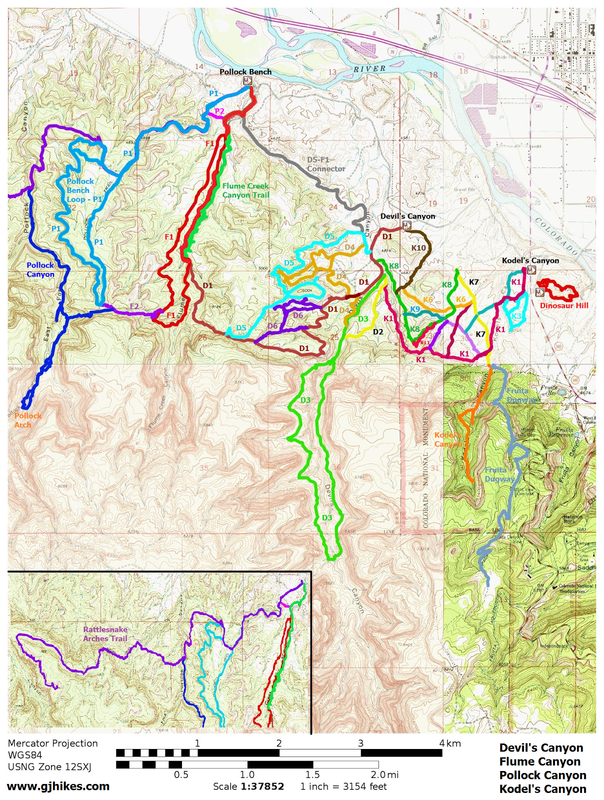 Parts of the trail also fall within the boundaries of the Black Ridge Canyons Wilderness Area. To get to the trailhead drive about 1 mile north from Fruita towards the Colorado National Monument on Highway 340 and turn west at Kings Row. Follow the road through Kings Row Estates where after a half mile the pavement ends and the road becomes gravel. Stay to the left and follow the road for about another half mile to the Devil's Canyon turnoff which will be on your left. The trail departs from the parking area at the end of the road. The D1 trail is the main route from the trailhead from which all the other Devil's Canyon trails are accessed. Square white posts and brown mylar trail markers make an easy task out of route finding but it still never hurts to have a map of the area handy until familiarity makes it unnecessary. Following the D1 trail from the parking area you will pass the D5 turnoff on the right within the first half mile, and the K8 turnoff on the left just past the half mile point. Within another tenth of a mile the K1, D2 and D3 trail junction comes up on the left. The D3 trail is the one that actually extends into the confines of Devil's Canyon itself. The D4 spur that leads to Devil's Canyon comes up on the left at 0.88 miles and the main D4 trail comes up on the right just under the 1 mile point. The lower end of the D6 trail is about a quarter mile past the main D4 trail. After passing the turnoff of the main D6 trail the D1 trail begins gaining elevation at an increased rate. Just before a switchback in the trail a spur of the D6 trail makes a connection on the right. Here the trail continues climbing along an old road that was cut into the side of the mountain. Just under the 2 mile point an overlook trail branches off on the left. Taking the overlook trail isn't necessary to get to where this picture was taken though because it is at the point where it rejoins the main route. From the overlook the trail begins passing through a hidden valley area that looks a bit like a fault line. This part of the trail is secluded from view of everyone except for hikers on certain parts of the D5 trail which is on top of the higher hill to the right. From the high point of the trail you can see all the way over the Pollock Bench area to some of the cliffs above Pollock Canyon. From here the trail gives up some of its hard earned elevation as it drops down into the Flume Canyon drainage. Once on the Flume Canyon side of the mountain the trail descends at a more gradual rate as it turns north along the cliffs. This part of the trail is much less traveled and the majority of tracks are made by horseback riders. We did see some wild turkey tracks though. There were a few birds too far away for a good picture that were gobbling away to each other. Right around the 3.5 mile point the D1 trail comes to an end after connecting up with the Flume Canyon F1 trail in a wash. 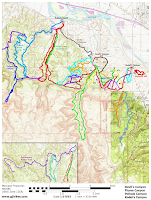 The profile map lays out the trails ups and downs as it journeys to and from Flume Canyon. The total elevation gain for this hike is around 1600 feet. The Devil's Canyon area is a fun place to explore and get some good exercise. The D1 trail is the backbone of the rest of the trails so there is no way to miss out on hiking at least part of it. Although it requires a little more effort than its neighbors if good views and exercise are what you are looking for you shouldn't leave disappointed. If you would like to see it for yourself then all you have to do is 'Take a hike'.